Happy Friday everyone! I hope that you’ve all had a good and productive week, which means that you’re probably feeling as ready for the weekend as I am! 1. 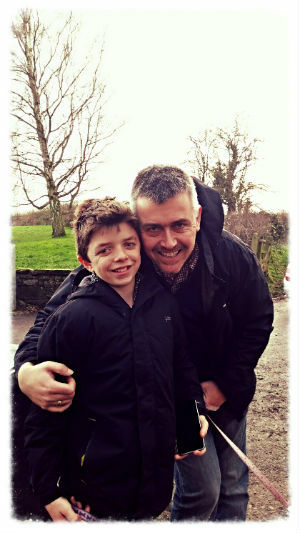 Number one, obviously, has to be having B home for the weekend, which was lovely. We were home by quarter past six, so had a great family Friday night, eating Chinese and watching “Death in Paradise” together – a brilliant start to the weekend. 2. 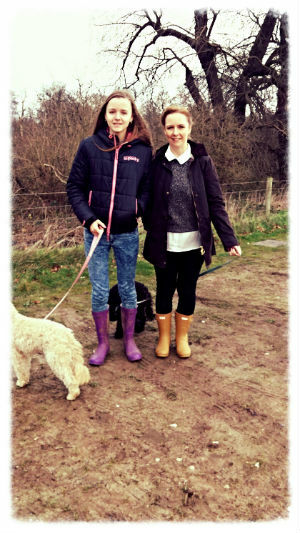 We had a nice family walk on Saturday to Barton Marina. 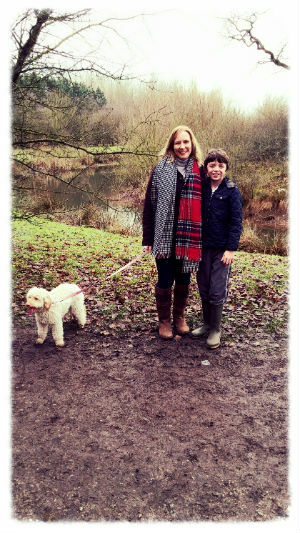 We used to walk there very regularly when we lived closer by but it had been a while since we had last visited, so we all enjoyed a good walk, and G and B were very happy with the bubblegum ice cream they bought at the end of it! 3. I had a quick trip to Primark later on Saturday which proved very fruitful – as always! I managed to find a lovely blue and white striped shirt which I’d seen online and liked the look of, plus some new sportswear and equipment, including an exercise ball, which I’ve been enjoying using this week. 4. 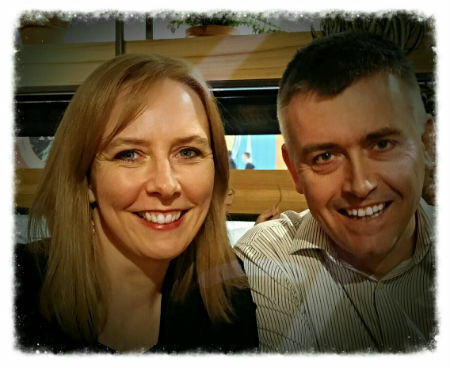 We ate out on Saturday evening, as we often do when B is home, at Ask Italian in Derby. We enjoyed a lovely meal, made extra special by all being together. 5. G and I put our new sportswear and equipment to good use on Sunday, when we did a workout together, focussing on yoga and experimenting with the exercise ball, which was great fun. 6. 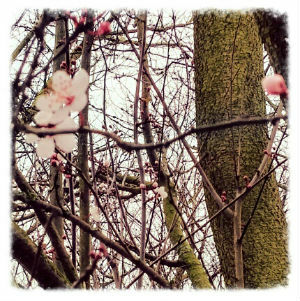 Although we haven’t yet had much of a winter, there are suddenly lots of signs of spring popping up, from the delicate blossom we spotted on one of our walks, to huge swathes of daffodils on the grass verges near to the hospice, to all the bulbs which I planted a few months ago beginning to shoot up, which is good to see. 7. After seeing it mentioned around and about for the past couple of years, I eventually got around to downloading and making a start on the “Couch to 5k” running programme. I have so far completed two of the three days which I need to do this week (third one will happen later today!). 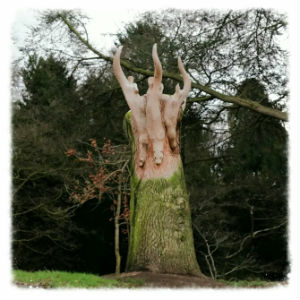 I can’t say that I’m enjoying it – I think that I really am the world’s worst runner – but it does bizarrely leave me feeling very energised afterwards – and, therefore, productive, which is a good side effect! 8. I had a lovely evening on Tuesday this week at Quad in Derby with a friend, enjoying a cinesupper – a meal and catch up, followed by watching “Room”, which is a great film. Not the easiest to watch, but the performances in it, especially by the young Jacob Tremblay, are amazing, and it is incredibly well-made, so I loved both it and the chatting time beforehand. 9. 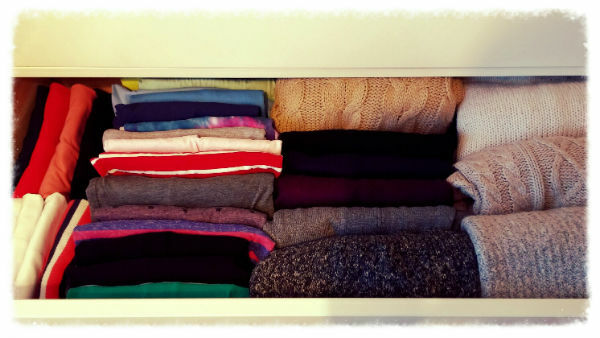 The other thing which I have finally done this week is read Marie Kondo’s “The Life-Changing Magic of Tidying”. Again, I have heard and read about this for quite a while now, but thought I’d give it a go this week. I haven’t quite finished reading it, but it inspired me to make a start on the first task, clothes, anyway – the result of which is seven bags of clothes, shoes and bags to give away, and beautifully organised drawers and wardrobes, which definitely make me smile! There is lots more of the house to tackle, but I feel that I’ve made a good start. 10. The final one for this week involved me and D taking advantage of G being out all evening on a school theatre trip to have a “date”, which consisted of D cooking a delicious meal – steak from our favourite butcher, roasted potatoes and asparagus, followed by gooey chocolate puddings – accompanied by a little Prosecco, of course. Fabulous! I have a lovely weekend in Norfolk ahead. I am going with my sister and, although we own the house there together, the two of us have never stayed there without anyone else, so I’m really looking forward to it. 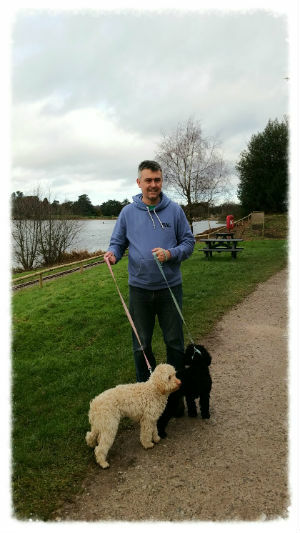 A good walk and then a meal out on Saturday night are as far as we have got with our planning, which is perfect! 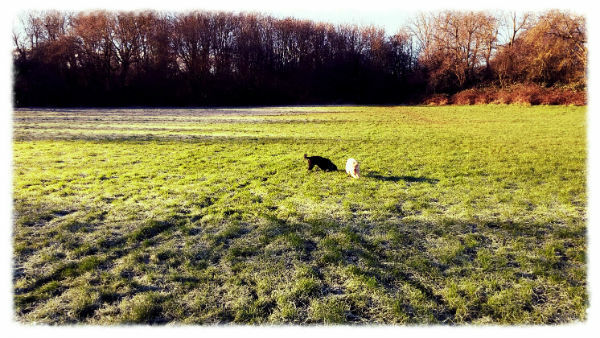 Eventually the rain, and therefore the field, dried up enough by the end of last week for me to be able to let the dogs off their leads to run around like crazy things! It had been a complete quagmire for the past few weeks, so it was a real treat for them – and so nice to see them having so much fun together! 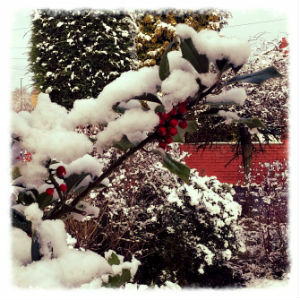 Christmas may be well and truly over (four weeks ago already – what?!?) 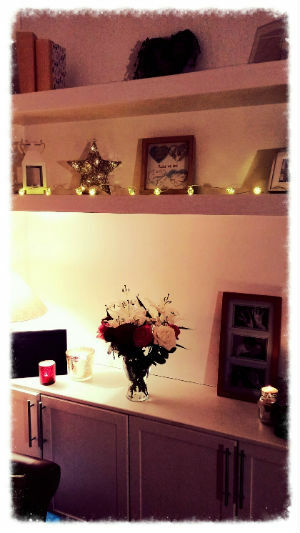 but fairy lights and candles are still being lit just about every night in our house – simply because they are so pretty. Love them! 3. Obviously a big highlight of the weekend was the snow! 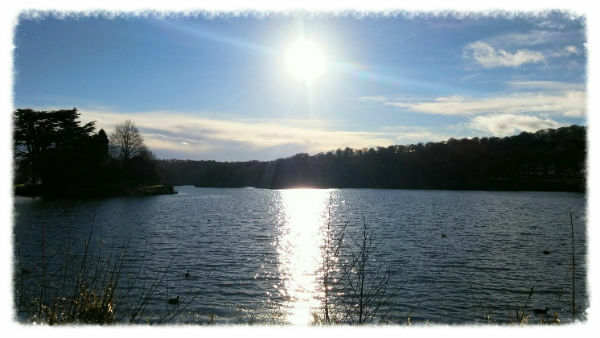 I do love it, but not when it disrupts work and school, so it was great that it came on Saturday night so that we woke up to these lovely scenes on Sunday morning – and then was all gone by the start of the working week – perfect! 4. The cold snap in the weather has meant that the woodburner has been put to very good use this week, as we have lit fires every evening. Installing this is definitely one of the best things we have done to the house – by far! 5. I started my volunteer training at the hospice last week, and I’m really enjoying it. The first session was the foundation course, in which we were given lots of information about all different aspects of the hospice by the CEO and the directors in charge of the various areas – operations, clinical, retail, marketing, finance, etc. So interesting. This week’s session was the first of the actual volunteers course, and it gave us a better chance to get to know each other a little more whilst discussing various questions and topics. 6. I believe that I have mentioned this one previously, but I am so grateful that my job allows me so much flexibility, as came into play on Wednesday when G was unwell at school and I had to collect her at 11am. An afternoon of sleeping on the sofa in front of the fire made her feel much better fortunately, but I was so grateful that I could collect her and carry on working at home without any difficulty. 7. There have been some stunning sunrises this week, especially on Tuesday. 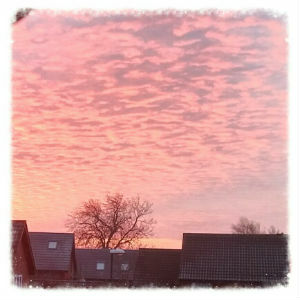 The photo really doesn’t do it justice – it was possibly the brightest pink sky I have ever seen, which certainly helps to start the day off nicely! 8. 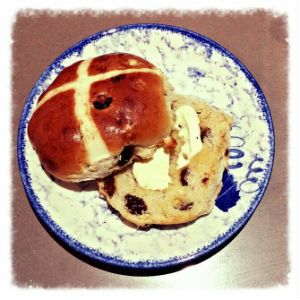 We may still be two months away from Easter, but I couldn’t resist the hot cross buns on my way home from work on Thursday! A truly delicious lunchtime treat! 9. Tilly was trimmed yesterday, which always seems to put a real spring in her step for some reason, which is so lovely to see (as she is often a bit of a crotchety old woman!). It will mean she dries far quicker after our walks too, which is definitely a good thing. 10. Last one for this week – it’s Friday and I’m going up to fetch B home for the weekend! Hurrah! We are all really looking forward to having some full family time together, so are very excited. Well, that’s the first complete week back in the work/school routine done, so my first Happy Friday post of the year. It’s been a pretty good week, all in all, despite being a little worried about B having his first cough and cold whilst away at school, but I’m sure that the matrons are keeping an eye on him for us. 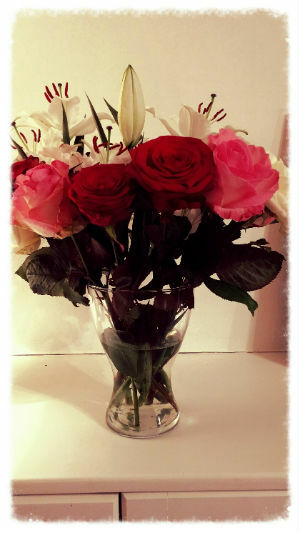 D came home on Friday night armed with the most beautiful bouquet of flowers and bottle of Prosecco – what a fabulous start to the weekend! 2. 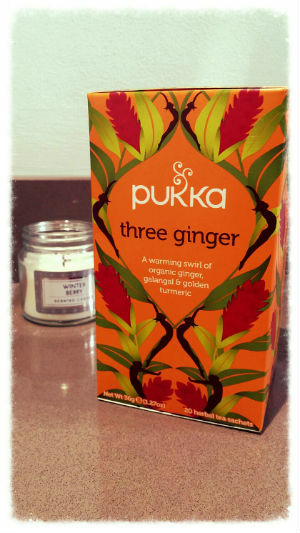 I discovered a lovely new tea at the weekend – Three Ginger from Pukka. I love all things ginger and this is definitely no exception. 3. I had bought some new bedding for our room just after Christmas and so I put it on at the weekend, and I absolutely love it. 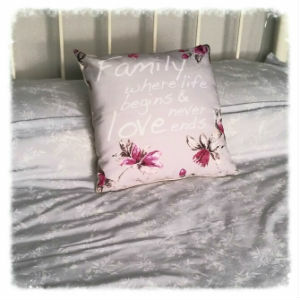 It’s pale grey, with a delicate white floral design, so looks perfect with our grey and white walls. 4. 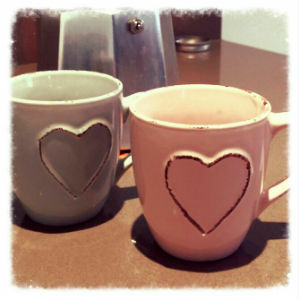 We used some lovely little mugs which we had been given for Christmas for the first time at the weekend. 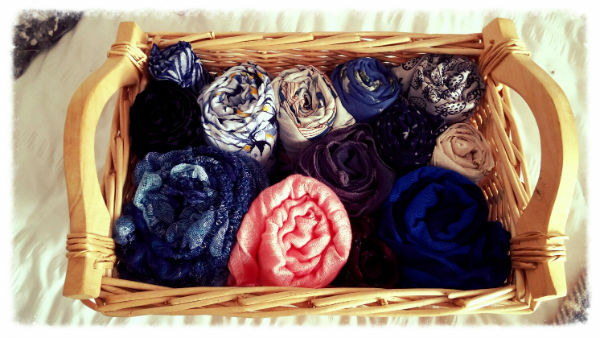 They aren’t large enough for tea, but are just perfect for coffee, and are the most lovely pastel colours. 5. D and I had a good planning session whilst G was climbing on Saturday morning, making plans for all different aspects of life, such as health and fitness, home and finances, family, etc. It felt really good to have some proper plans in place which we can review regularly and will hopefully keep us on track to achieve what we’d like to this year. 6. We had a very successful trip to Dunelm Mill, with the aim of buying some new mugs and bedside lamps for our room. Not only did we come away with some beautiful, simple white China mugs with an embossed daisy (!) design and a couple of lovely white bedside lamps, but we also happened to purchase a slow cooker in the sale! We’ve never used one before, but are very much looking forward to trying it out at the weekend. 7. 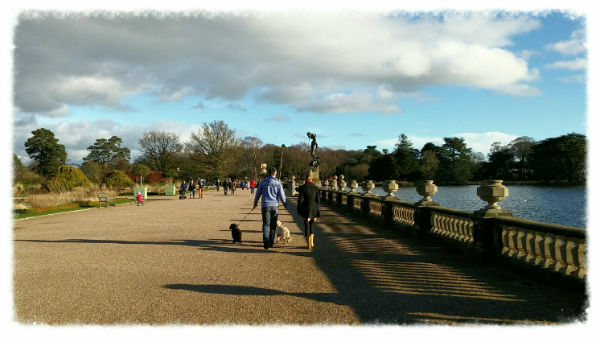 We had a lovely trip to Trentham Gardens on Sunday, which I described in more detail in my mid-week post. 8. I had tried to get some new pyjamas after Christmas but couldn’t find any that I liked, but then stumbled across some lovely, cosy ones whilst shopping last Friday. I absolutely love them – so much so that I have been in them by 8 o’clock every night this week! 9. We received a pastoral report about B this week, which was great. It wasn’t too lengthy but had sections completed by his form tutor, housemaster and head of year, and was so positive. It referred to how well he has settled into boarding life, how conscientiously he is working and just what an all round superstar he is (okay, that last bit was my interpretation of it, but it was lovely!). 10. “Death in Paradise”!! We all absolutely adore this programme and so were thrilled when it returned to BBC1 last week. We can’t watch it on the actual day it is on, as G is at cadets then, but it is becoming our family ritual to all sit down and watch it together on a Friday night, as an “end of the week” treat. Can’t wait for tonight! We are hopefully (dependent on G’s homework load) going to venture to Stratford-upon-Avon this weekend, to visit Shakespeare’s Birthplace, which should be really interesting. I hope that you have a fabulous weekend, whatever your plans are. 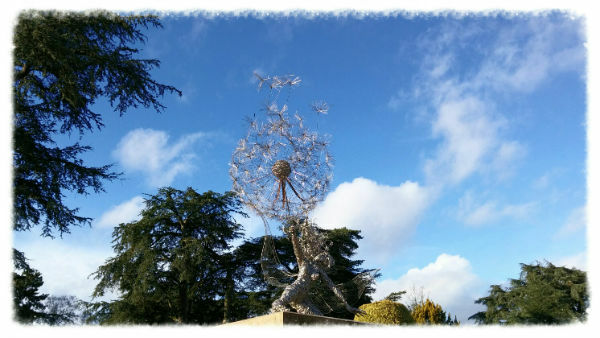 It eventually felt as though a proper winter’s day had arrived on Sunday, rather than the dull, grey, wet weather we have endured for the past two months, so we decided to make the most of it and head out for a trip to Trentham Gardens. 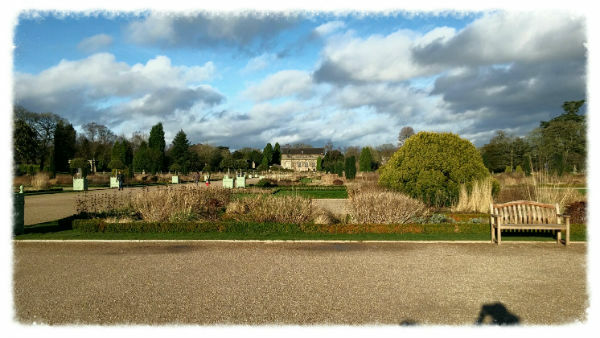 This was also partly spurred on by the fact that we had some Tesco Days Out vouchers which expire at the end of the month and can be used at Trentham, but it also transpired that the entrance price is currently reduced until mid-February, so it is a really good time to visit. As many, many people evidently thought, as it was really busy (despite how it looks in these photos below)! 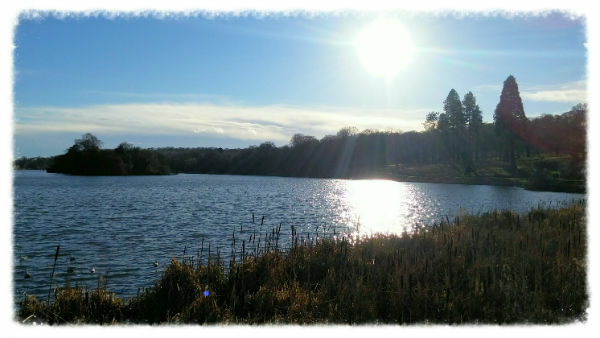 We had a lovely walk around the lake, a route which takes you beside the River Trent, past the bird hide, through the cascading weir and along a selection of woodland trails. 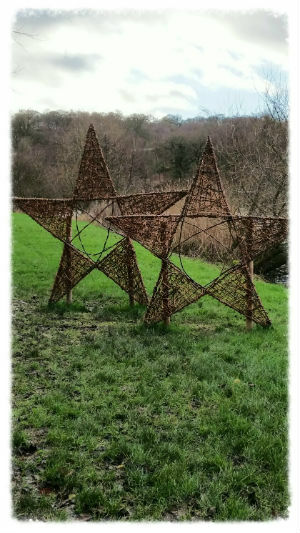 It is a very dog friendly place to visit, which, of course, is exactly what we look for, and there were lots of different things to spot along the way – all sorts of statues and sculptures constructed out of various materials – wicker, metal, wood, etc. 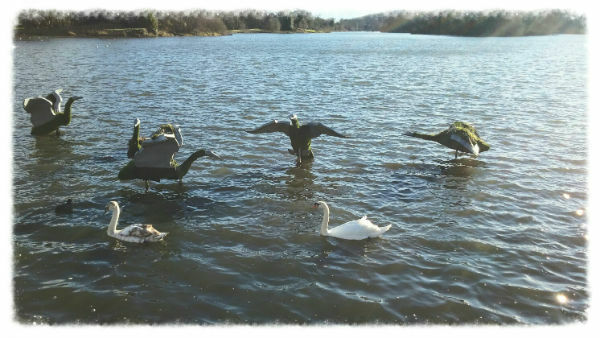 There are plenty of different areas to visit once inside the gardens, including the great adventure playground if you have younger children with you, but we stuck to the lakeside walk, which happily concluded near to the Italian Garden Tearoom, which enjoys beautiful panoramic views of the lake and garden. 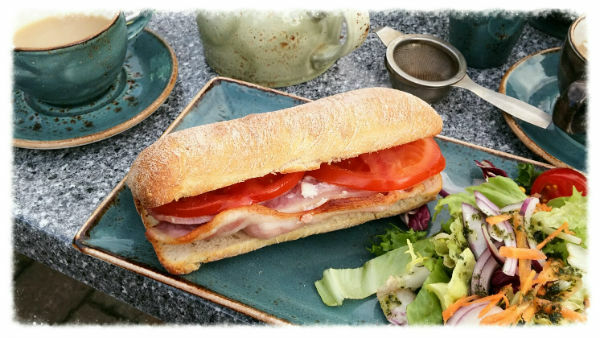 We sat outside, as we had the dogs with us and sitting in the sun was actually really pleasant by that point, and had a spot of lunch – pots of Earl Grey and bacon ciabattas for me and D, whilst G plumped for the Staffordshire oatcakes with bacon and cheese. We then headed out, with a brief potter around the various shops which make up the Trentham Shopping Village, returning home to get on with the rest of the weekend. 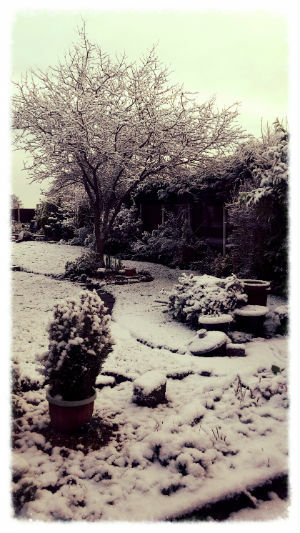 It was a really lovely wintry trip – one which we will definitely be repeating. 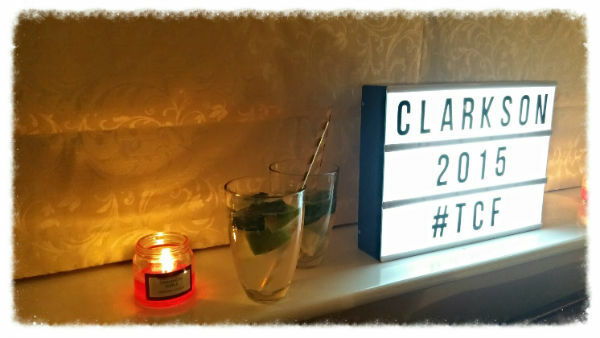 Well, it’s been three weeks since my last post, due to the Christmas and New Year break, so I thought that I’d do a quick round-up of the past couple of weeks – which were just so lovely! 1. 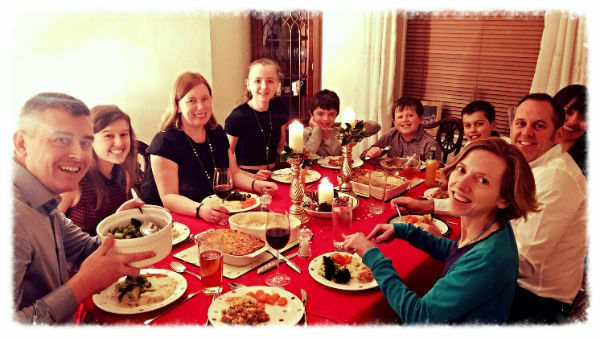 18th December – a Christmas meal with friends from the village in which we used to live. It is always good to catch up with them and we had a delicious Christmas meal. 2. 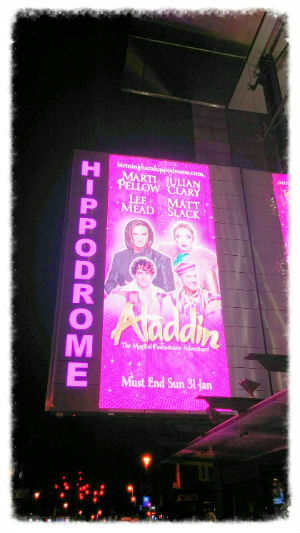 19th December – the pantomime, Aladdin, at the Birmingham Hippodrome. This was absolutely amazing!! I have not laughed so much in a very long time, and I have seldom seen the children laugh so much either. The performances were fantastic, especially by my favourite Lee Mead, Matt Slack who played Wishy Washy and also Widow Twanky. 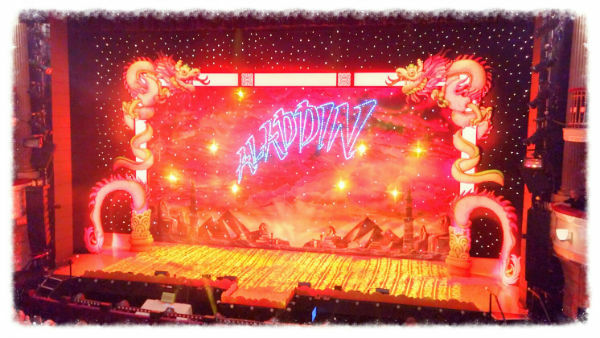 Julian Clary was, of course, hilarious, and Marti Pellow made a pretty good “baddie”, and the 3D section was incredible. An absolutely brilliant night! 3. 20th December – our annual “present swap” at my sister’s house. As we were not going to see each other on Christmas Day this year, it was even more important that we got together to catch up, eat mince pies, drink mulled wine and swap presents – a lovely afternoon. 4. 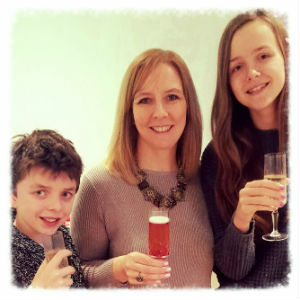 21st-23rd December – a lovely, relaxing few days with the children, doing little apart from playing games and watching Christmas films – perfect. 5. 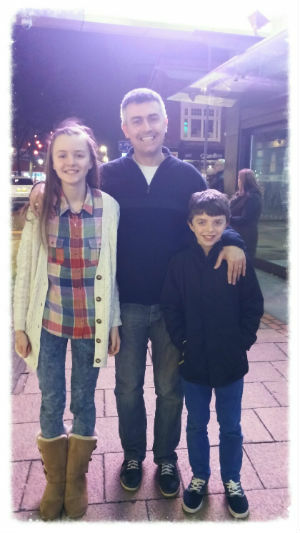 23rd December – another meal out (we had had one before seeing the pantomime in Birmingham) before a theatre trip, this time to see Cinderella at Derby Theatre. This wasn’t a panto, but a re-telling of the story by the mice, and it was brilliantly done, so another very lovely evening. 6. 24th December – the Christmas Eve service at Derby Cathedral, which was so nice – it’s a very traditional service, with plenty of opportunity to sing the old carols, so we love this. This was then followed by a roast turkey dinner at home, finished off with roast chestnuts in front of the fire. 7. 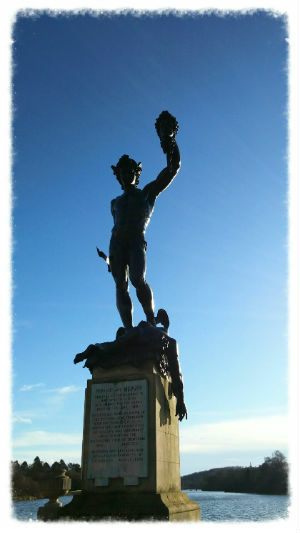 25th December – as usual, Christmas Day was enjoyed by all. 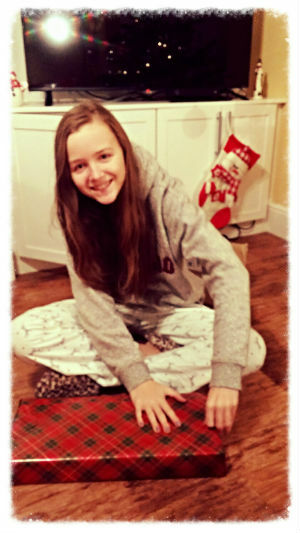 We were all very lucky with the presents we received – my new wax jacket and Hunter wellies have been put to very good use plenty of times already. We had a Caribbean-themed lunch – lime and ginger marinaded seabass, sweetcorn fritters, spicy ribs, jerk burgers and saffron rice, followed by pineapple upside down cake. D’s parents arrived late morning, so we ate together then spent the afternoon mainly playing the new games we had received – Family Fortunes, The Logo Game and Suspend – lots of fun. 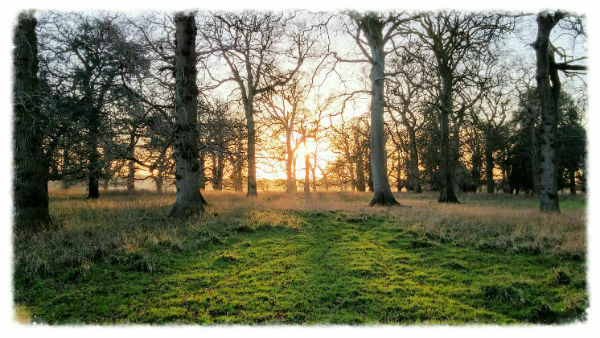 The day was nicely finished off by a couple of hours in front of Downton – a great end to a lovely day. 8. 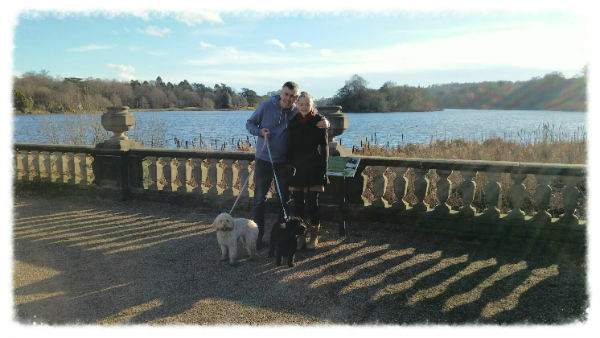 26th December – we went for a lovely walk at one of our favourite places, Calke Abbey, on Boxing Day. 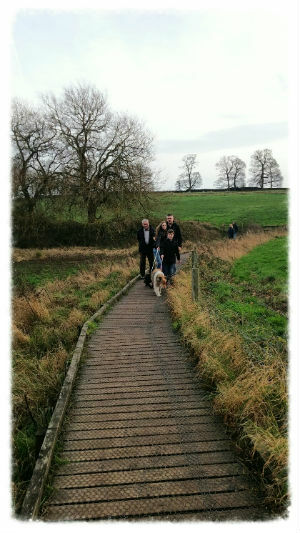 Plenty of other people had had the same idea – I’ve seldom seen it so busy – but we had a great walk and blew the cobwebs away! 9. 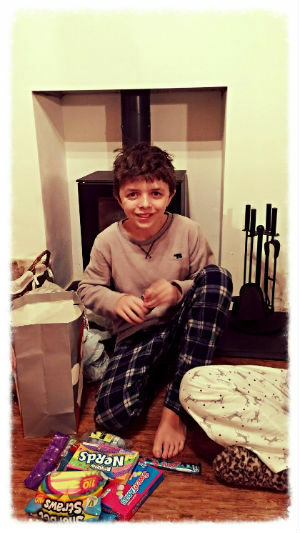 27th December – after D’s parents had left, we had a family trip to the cinema, which was part of B’s Christmas present to us all. We saw Daddy’s Home, which was really good – not too silly, but very funny.28th December – we went to visit one of my sisters in the evening, for canapes and games. Again, this was another evening absolutely full of laughter – Pictionary, Charades and Articulate this time – hilarious! 10. 29th December-2nd January – we headed off to our house in Norfolk for a few days. 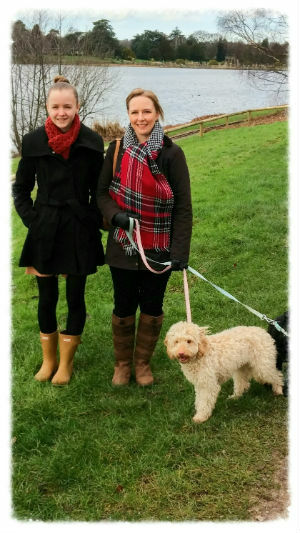 Although the weather certainly wasn’t Christmassy, we got a couple of good walks in while we were there – which we needed to counteract all the cheese, snacks and wine we were consuming! 11. 31st December – we had a great New Year’s Eve, with some of my university friends who made the journey down to Norfolk to celebrate with us. 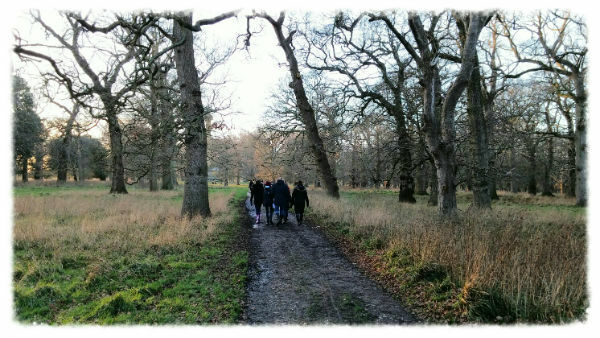 We had a walk at Holkham Hall in the afternoon, followed by an “old school” meal of cottage pie or fish pie with vegetables, then two different types of fruit crumble and custard – accompanied by plenty of wine, of course! We then played yet more games (a definite theme this year, even more so than usual!) of Family Fortunes and Obama LLama (my favourite new game!) until midnight, which we toasted in with champagne and a round of Auld Lang Syne. A really fun night! 12. 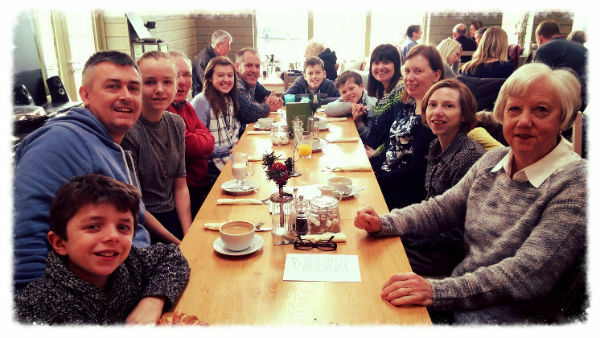 1st January – we all felt pretty good the next day, which was fortunate as we had a New Year’s Day brunch booked at Creake Abbey. This was just what the doctor ordered, starting the new year with a full English breakfast – we really didn’t need that much more food, but it was delicious! And that was just about the end of the Christmas/New Year bubble which we’d lived in for two weeks. It really is my favourite time of year – full of lots of time with family and friends, plenty of food and drink, and the opportunity to switch off from the real world for just a couple of weeks. The only sad thing is how quickly it went – and that it is now over for another year. I’d love to have that time all over again – but the memories will have to suffice for now. A huge thank you to all our family and friends for sharing this special time – and Happy New Year everyone!